The operative word is the fifth one of the title: Why the Jews rejected—instead of killed—Jesus. Klinghoffer (The Discovery of God, 2003, etc.) has a lot of well-meaning, goodhearted Christian friends who wonder why he, an observant Jew, doesn’t accept Jesus as his personal savior. This is an apologia, a 200-page answer, to those friends’ queries. The crux of the matter is that Jesus of Nazareth didn’t accomplish what “the promised Messiah had been advertised as being destined to do from Daniel back through Ezekiel and Isaiah and the rest of the prophets.” He didn’t, for example, rule as a successful king and establish world peace. 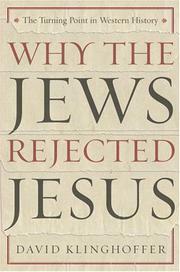 Klinghoffer takes readers on a cook’s tour of Jewish-Christian history, showing not only why many Jews in the first century didn’t hop on the Jesus train, but also why Jews in the medieval and modern periods have resisted Christians’ often coercive, sometimes violent attempts to convert them. He has spiced up an otherwise historical account with the polemical claim hinted at in the Cahill-esque subtitle. If most first-century Palestinian Jews had accepted Jesus, then Paul would never have spread the Good News to Gentiles, and, in consequence, Christianity would have simply remained a Jewish sect and would have been overtaken by normative, rabbinic Judaism, eventually dying out. Europe, then, would have remained pagan, America might still be in the hands of indigenous people, and so on. This is all singularly silly, and its placement at the very beginning may well turn off some of the very readers Klinghoffer presumably wants to reach, his well-meaning Christian friends with their question about the Jews and Jesus as the Messiah. His book, to be sure, isn’t flawless. And that it does fill a real hole in the religion shelves, and that the fumes from Mel Gibson’s Passion of the Christare sure to further pique readers’ interest, make its flaws all the more disappointing. A readable, though also tendentious, foray into Jewish-Christian relations.